Domes are regarded as architectural marvels due to their hemispherical shape and complex construction requirements. Some of the world’s most renowned edifices are topped with hemispheres. Here are some of the most famous domes on the face of the planet. 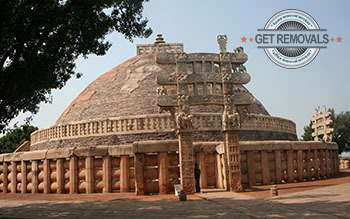 The Great Stupa – Located in Sanchi, the Great Stupa is the oldest stone-made structure in India. It was commissioned by Emperor Ashoka the Great during the 3rd century BC. The legend claims that the building is built over the relics of the Buddha. During the 2nd century BC, it was the subject of an expansion project which doubles the structure’s size. During the remodeling its dome was flattened and ornate with a three-level parasol arrangement which is enclosed with a square railing. The hemisphere that tops the building is approximately 16 metres tall and has a diameter of 36.6 metres. In 1989, the Great Stupa was recognised by UNESCO as a World Heritage Site. Eden Project – The Eden Project is the world’s largest greenhouse. The construction of the complex took an estimate of 30 months and it was officially opened to the public in 2001. The main edifices of the venue are two gigantic domes which are adjoined with two smaller domes on each side. The first building mimics a tropical environment while the second mimics Mediterranean climate. The structures are used for the housing of plant species from all over the globe. The domes have a steel frame which is covered by thermoplastics and were designed by prominent English architect Nicholas Grimshaw. The Eden Project has become so popular that today it is considered as one of Britain’s must visit sites. So make sure that you visit the complex as soon as your removal project is over. Sheikh Lotfollah Mosque – Built during the 16th century this religious building is considered by many architectural experts to be one of the finest examples of Persian architecture. The mosque is situated in the Iranian city of Isfahan and is one of the country’s most popular and visited landmarks. The edifice was designed by renowned Persian architect, mathematician and scholar Shaykh‐i Bahāʾī. The mosque was private and served only the royal court which explains why it doesn’t have any minarets. However its flattened, colourful and beautiful ornate dome is its main feature. The hemispherical structure has a diameter of exactly 13 metres. St. Paul’s Cathedral – One of the world’s most popular cathedrals is one of London’s most distinguishable buildings. It was built during the late years of the 17th and early years of the 18th century and officially consecrated in 1708. The edifice’s dome has an inner height of 68 metres and an outer height of 85 metres. It outer diameter is 34 metres. The entire structure was designed by Sir Christopher Wren. So, make sure that you visit this amazing cathedral as soon as your relocation is over. You can ease it up by using removal services. Honourable mentions: Santa Maria del Fiore in Florence, Shah Mosque in Isfahan and Dome the Rock in Jerusalem.